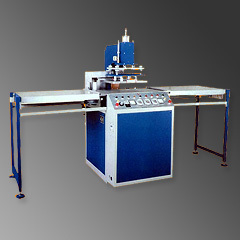 Manufacturer of a wide range of products which include high frequency plastic welding machine. Two Alternative Platens to slide right and left smoothly, so that preparation of process can be done on both platens in turn. Built-in arc suppressor and overload circuitry with digital timers and counters. Easily operated, the machine offers accurate positioning of products. Hydraulic power pack can also be provided for higher welding presser. Looking for High Frequency Welding Machine Shuttle Tray Type ?